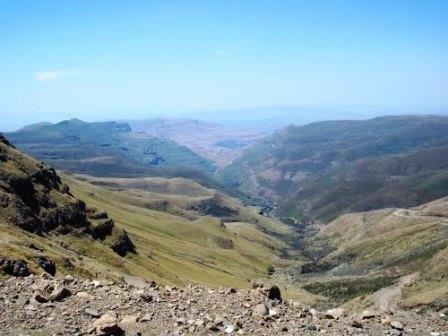 The Sani Pass starts at 1544m and rises 1332 vertical meters to summit at 2876m. This altitude gain is almost 300 meters more than its nearest competitor - the Naude's Nek Pass in the Eastern Cape. The Sani's average gradient is only 1:20, thanks to the long easy gradient section in the foothills of the Drakensberg, but certain sections are as steep as 1:4 and it is here that most drivers come unstuck when the going gets slippery. The large number of car wrecks down the ravines bear mute testimony to the dangers. 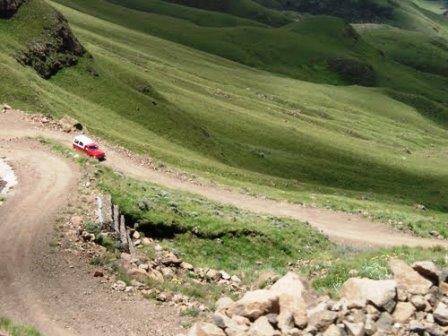 Many visitors travel from abroad to tackle the notorious Sani Pass in hired 4x4's. Such is it's reputation. For most South African's it remains more of a dream. There has been talk recently of tarring the Sani Pass. There was an immediate rash of objections from a range of individuals and societies interested in preserving the true, raw nature of the area, but I presume that ultimately, progress will have it's way. Should the tarring project go ahead, the challenge and allure of the Sani Pass will move from a tough 4x4 route to a casual afternoon drive in a hatchback. Whilst it's still there, make a plan, and drive the Sani. It will leave you feeling like a child - in it's sheer size and scope. The pass holds an attraction for advertisers too - recently two TV commercials were filmed on the pass for Nissan and Ford vehicles respectively. The road connects the KZN town of Underberg with Mokhotlong in Lesotho. Himeville and Underberg are approximately 20 km to the south-west with Mokhotlong in Lesotho about 60 km to the north-east. The lower reaches of the pass has several hotels and a wide range of guest farms, B&B's, lodges and other self-catering accommodation on offer. Always check with authorities or local business owners as to conditions on the pass before attempting the pass. Obviously the pass experiences its most frequent closures in winter, when snow is the common culprit. It's difficult to establish exactly where the pass starts in KZN. Determining this point affects all the vital statistics. In most cases passes start at a river crossing or low point. We have used the set of dams in the valley North of Underberg as the starting point. Once you are heading north the attractive gravel road progressively narrows and worsens as the hotels, and guest farms are left behind at lower altitudes. The well known Sani Pass Hotel and Golf Course is one of the final landmarks to look out for before entering the Mhkomazana Valley. The bulk of the Drakensberg looms ahead with no apparent way through. Soon you will arrive at the South African border post. Note that this is not the official border between SA and Lesotho. The border is actually right at the summit, where the Lesotho border post is located. Several books and websites incorrectly don't acknowledge the Sani as being the highest pass in South Africa - they all assume the border is at the SA border post. Make sure you have your passport with you and that is valid for at least 6 months. You will also be required to produce proof of vehicle ownership and insurance. The South African authorities may refuse you permission to drive the pass if they deem your vehicle unfit to tackle the conditions. This is for your own safety. Note that both border control points close at 18h00. Allow yourself a good two hours to complete the pass and you don't want to find yourself marooned between the two border control points by not making the cut-off time as there is a considerable distance to cover (almost 80% of the pass) between the two control points. 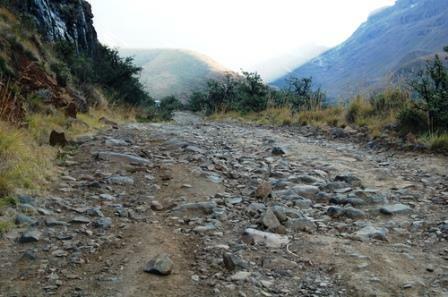 The Lesotho authorities are far less concerned about safety and allow normal vehicles through, but for the descent only. However, if it's raining, a normal vehicle will be sorely lacking in traction and you could well end up going over the side. 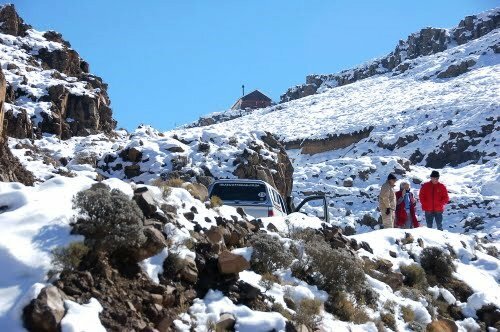 The Sani is strictly a 4x4 only route. On 26th October, 1948, Godfrey Edmonds (an ex RAF Spitfire pilot) was the first person to ever drive the pass in a vehicle. This was before the road was built. It took him five and a half hours to reach the summit and he was assisted by a team of Basothos with mules, ropes and other equipment. In those days, this achievement was akin to climbing Everest. It was a remarkable and led in no uncertain terms to the approval of the road construction. There is no official record of which vehicle he used, but I would imagine it would probably have been an open top Willys Jeep. In 1955 a local Natalian, David Alexander, using an ex British army Land Rover, formed a company called the Motkhotlong Mountain Transport Company - to take curious adventurers on the amazing 1332m climb up the Sani. Incredibly his company still exists and they still do the Sani tours to this day (still in Land Rovers!). I am astounded that Land Rover have never seen the pass as an advertising platform with folklore like this? Part 2 of the Sani Pass covers the section from the South African border control post to the summit at the Lesotho border control post and Sani Pass Chalets. This is where the serious stuff happens. Once you have cleared customs and made use of the immaculate toilet facilities at the border control point, the adrenaline part of your trip begins. The first half is just a casual drive, compared to what is waiting higher up the pass. Very steep gradients of up to 1:3 with loose rocks, mud, ice, and snow can all be encountered on this section. You can watch the scenery and the road if you drive very slowly. - Pic courtesy of chrjp You will need to have 100% concentration as you ascend the final six switchbacks near the summit. This section is also preferably driven in low range 2nd and 3rd gears. It is here that you will appreciate why only 4WD vehicles are allowed to drive this pass. 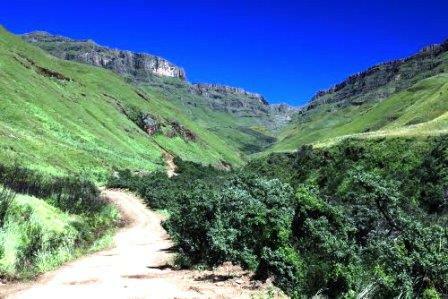 The beautiful Khomazana river valley steepens as the road gains altitude and the views become expansive. There is one specific sharp left-hand bend, where there is parking for four or five cars with a lovely viewsite - and if the skies are clear, you will have the opportunity to take beautiful photographs from this vantage point. There is no need to worry too much about encountering mules on the pass, as your speed will by necessity, be slow enough to stop with time to spare. 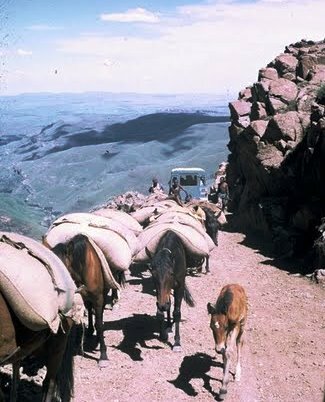 Residents from Lesotho still use donkeys extensively as their primary mode of transport and the scene depicted below is quite common. Donkeys are used to lug basic foodstuffs and provisions back up the pass after having being purchased in South Africa. This lends a new meaning to mule shopping versus mall shopping! Please be patient and give way to the animals. After the view-site described above, the road starts to enter into the first set of switchbacks. These get increasingly steeper, rougher and tighter as the summit looms. A winter wonderland on the Sani Pass. - Photo courtesy of JerryvhThe altitude gain along this final section is rapid and you might experience nose-bleeds, headaches and popping ears. Once you enter the switchback section, there are very few places to stop safely. Most of the hairpin bends are 180 degrees or close to that number. Some of them allow sufficient space for one vehicle to stop. At the time of filming (Oct 2013), roadworks were in progress near the summit, whereby the hairpins were being widened to make the road a bit safer. If you traverse this final section in clear weather, consider yourself fortunate, as on most days it is under cloud. It is also possible to experience severe summer electrical storms and extremely strong winds throughout the year. Drive deliberately, remain in the right gear, maintain your momentum and stay sharp. We want you back to drive more passes! Please note that the actual RSA/Lesotho border is at the summit and not at the SA border control point. The entire Sani Pass is on South African soil. When you arrive at the summit with a sense of awe and relief, prepare yourself for something of an anti-climax at the Lesotho border control post. The result of inexperience and / or poor decision making on the Sani Pass. - Photo: Courtesy of Jonah JonesThis consists of a run down old building, sadly in need of a coat of paint. You will need to get your passports stamped and pay the compulsory Lesotho road tax, which is calculated according to the size of your vehicle. As an example, in our group, the Toyota Hilux LDV and Pajero GLX paid half of the amount charged on the Nissan Patrol and Toyota Land Cruiser. With those formalities out of the way, you can bump your way over a short, but very poor quality road to the Sani Mountain Lodge (previously known as Sani Pass Chalets), where you can enjoy a rest at the highest pub in Africa. With a roaring fire and walls adorned with history and graffiti, you can while away a few lazy hours and get a meal as well. They also offer overnight accommodation. 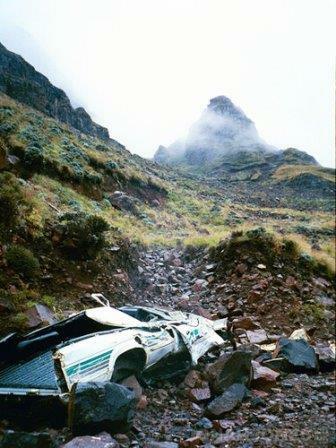 We have purposefully posted the above photo as grim reminder not to drink and drive and to be alert and well prepared when tackling the Sani Pass. It is not to be trifled with and many lives have been lost. Treat the Sani Pass with respect. Ironically, the wreck depicted here is a Nissan Sani! Once you have successfully negotiated the Sani Pass, you can give yourself a pat on the back. Below is a list of videos we have produced on various parts of Lesotho. If you are planning a first time visit to Lesotho, you will find interesting and useful information. Just click on the blue hyperlinks and hit your back-space tab (top/left of screen) to return to this website, as all the videos listed below are live on YouTube. We have produced a short video clip on the Sani Mountain Lodge (previously known as Sani Top Chalets), which boasts the highest pub in Africa! For many years Sani Pass has held the outright record for the highest pass in South Africa, but as recemtly as October, 2016, a new pass has been opened to the public which has finally exceeded Sani's altitude record by 125m. This is the '4x4 only' Ben MacDhui Pass, which summits at an ear popping 3001m. The Sani Pass remains as the most iconic pass in South Africa and the only factor that has the potential to remove that title is the possibility of the pass becoming tarred. Our take remains positive and even if the pass does get tarred, it will open it up to a vast new audience, which will boost local tourism and benefit the region considerably. Yes, the pass in its gravel form is for the purist and the 4x4 driver and this allure will be higely diluted, but there are more than enough other big gravel passes to satisfy that need.